I have been having this problem only with Pixhost trying to open pictures. I have tried ipconfig/release-renew, changing browsers, clearing cookies etc.....Anyone had the same problem and/or know of a solution to this problem?? Can you visit www.pixhost.to the main site? so others can try it - all pics are on individual servers so you can get different results depending on demand at the time. What extensions your using - many are known to cause issues with sites. As someone showed a few days ago in the imagehost problem thread it was the VPN (Virtual private network) connection that they were using that was being rejected by the site. I only had no script (allowed pixhost.to address) + my security suite as protection. For images hosted at Pixhost (or some similar name) you always get this bloody pop up saying 'Pop' & asking for an 'OK' which I always refuse to give seeing as I have no idea what I'm agreeing to or downloading or whatever. Does anyone know what it is & how they know it's really safe? Hopefully, no news is good news. But I saw a few things I thought worth reporting. It seems like many folks have found this host, and are using it. I have noticed some are uploading images without using the create gallery option. Evidently, creating a gallery is not the default setting. The create gallery option links the photos and makes it much easier for us to download your batch of images manually. So please remember to check that create gallery box. It might stay clicked. No gallery title needed, but you can add them if you want. 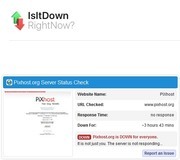 I did notice one pixhost outage a few days ago. I didn't try any image links, but will next time. I haven't noticed any image failures yet. Knock on wood. That is amazing compared to Image Bam, Box, and Venue. Haven't noticed any strange pop ups like howerd mentioned, but I have ad blocker enabled. One other problem I've seen is sometimes an image fails during upload. But it clearly tells you there was an error. Loading the batch a second time seems to work just fine. 2 nice things is that pixhost remembers the folder you just used, and it keeps your filename in the image codes, and in the filename it uses to save the image. Imagevenue makes me re-browse for the folder every time I save an image. Imagebam now seems to drop my filename and insert some strange code name. These coded file names don't even keep them in order. Maybe my ad blocker is causing these problems. But all seems to work fine on pixhost. I do not recommend using pixhost for your only image host, because they will have a bad day somewhere along the way. But I like them enough to reload many of my images there for my posted images. I kept many of the old uploads on other hosts, if all the images were still working. Setting them up to be accessed through gallery links. This makes them accessible as mirrors in case pixhost does fail, or shutdown. We'll see if they last. I have noticed a few members including mirror gallery links to other hosts in their new posts. They posted their main images on pixhost, plus a mirror gallery link to a second host. Inspired me to do more mirrors. With all the image host failures, and near failures, mirror galleries seem like a good thing to do. There are other good reasons to create galleries. But so far so good with pixhost, other than once for an hour or so. pixhost has been working well, but they must be having another one of their outages today. Posts that were previously populated with clickable thumbnails are not loading. That's what I saw the other day too. not even the thumbs opened. As for today, I checked some of my posts 10 minutes later, and the thumbs are now showing, but full size images have a problem. Firefox reports an expired certificate. Update - 6 more minutes later, full size images are working again for me. Update - Hour and a half now, and still not working. Like the site is not there. It looks like a routing or DNS problem. Using my usual ISP, the site won't come up but using VPN, everything works fine. Hopefully they can get that fixed soon.